Men’s shoes can be very bulky. Buy light or foldable dress shoes so they will take up less space in your luggage. When you choose clothes to pack, pick items that color coordinate. All your clothes will go with everything else, including your one or two pair of (size 13!) shoes. Insert your dress shoes in an old pair of socks to protect them in your luggage and polish them when you are ready to wear them. On travel day, wear shoes you can run in, just in case you have to book it! In department stores, men can ask for samples of shaving cream which are great for for travel. Additionally, Ron is a tech-wizard. He suggests the following smartphone and tablet apps for making your trip a breeze. Use your airline’s apps to check in and link your your boarding pass to Passbook. Passbook keeps boarding pass on your lock screen so you can access it at the gate with one swipe. Be sure to also print your boarding passes in case the gate scanner doesn’t work. For a long trip out of town (2 weeks or more), Ron recommends eating local honey, and taking organic apple cider vinegar to keep healthy. And for New Yorkers or others who don’t own a car but often rent cars, avoid the pricey up charge for rental car insurance. Progressive and Geico offer non-owner car insurance that can be considerably cheaper than the daily rate charges by rental companies. Travel light. Pack as little as you can. Traveling light always makes the trip easier. Roll your clothes rather than folding them to decrease wrinkles and fit more in less space. Stuff your shoes with socks to keep the shoes’ shape. Hydrate! Airplane air is very drying, and dehydration is the leading cause of jet lag and general malaise. Don’t drink coffee on the plane, since it is drying. Carry a refillable water bottle so you can get enough water on long flights. If you’re unsure if your bag will be too heavy, check in with the Skycaps instead of the ticket counter. They tend to be more lenient. Be sure to give them a nice tip! Ron’s best tip: the secret armrest button. 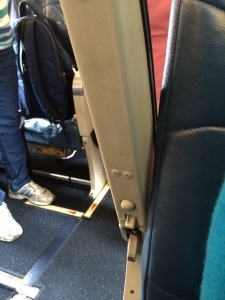 When on the aisle of an airplane, it can be nice sometimes to raise the armrest. Many plans have a tiny button on the underside of the armrest, near the hinge. Presto! Freedom! Look for our next edition of Opera Singers’ Secrets to Traveling Well coming soon!